Russell Westbrook (0) reacts after sustaining an injury against the Toronto Raptors on Friday. Maybe the Thunder finally got a break. In a season where Oklahoma City has dealt with guard Russell Westbrook missing 27 games in a row, it appears Westbrook is not showing any damage to the knee he re-injured Friday night. According to The Oklahoman’s Anthony Slater, Westbrook had an MRI and it revealed no further issues from the play that sent him out of the game midway through the third quarter. Toronto’s Kyle Lowry bumped into Westbrook’s right knee and Westbrook limped off the court and into the lockerroom. He did not return. 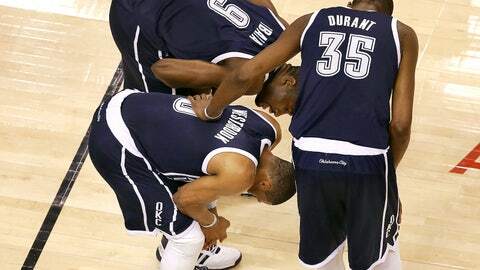 The Thunder went on to win in double overtime, getting 51 points from Kevin Durant. Westbrook will not play in both games when the team has back-to-back games and the team will continue to monitor his health, according to Slater. Oklahoma City played at Cleveland on Thursday, but Westbrook didn’t play. Westbrook started at Toronto on Friday. The team plays at home against Denver on Monday and then at Dallas on Tuesday. Coach Scott Brooks has not said which game Westbrook will play in.